The John Cooper School’s 14th Annual Signatures Author Series was held on Friday, November 30 at The Woodlands Waterway Marriott, featuring international sensation Kevin Kwan, author of the trilogy that began with Crazy Rich Asians, that was subsequently a box-office record-breaking feature film. Also featured were local authors, book signings, and luncheon that featured Kevin Kwan as the keynote speaker. 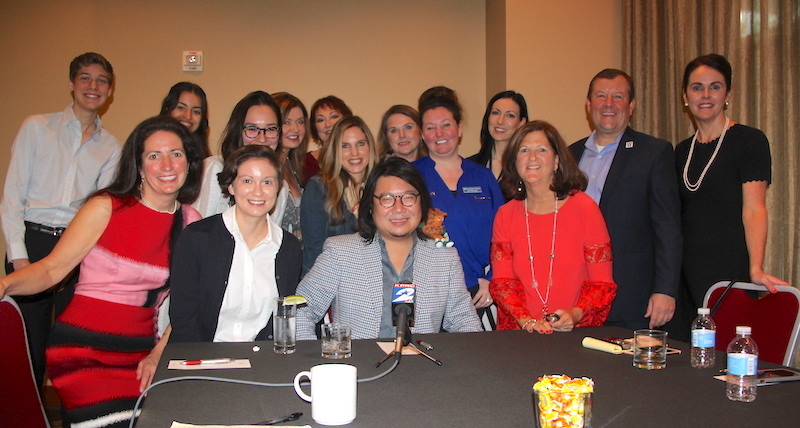 In a private interview prior to the event, Kevin Kwan shared his story and answered questions with the local media, including Hello Woodlands. Kwan cheerfully greeted each member of the media, sharing, “I very much believe in small local press.” Kwan shared how he moved with his family from Singapore to Texas when he was 11, graduated from Clear Lake High School, and earned a BA in Creative Writing from The University of Houston-Clear Lake. Kwan revealed that during his life here in Houston he wrote for the local paper, Houston Public Media, and was a freelance writer for the Houston Press. 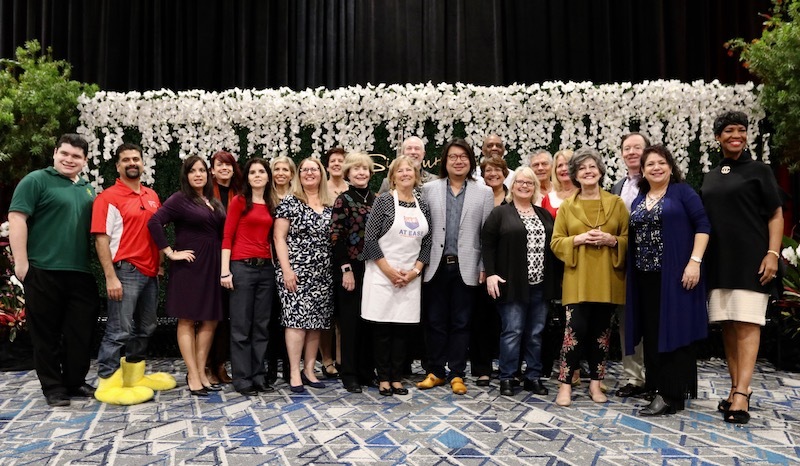 Local Media and Kevin Kwan at Signature Author Series. Photography by Deb Spiess. Kwan moved from Houston to Manhattan to pursue a BFA at Parson School of Design and spent his early years in the city working for Martha Stewart Living, Andy Warhol’s Interview magazine, and the design firm M&Co. In 2000, Kwan established his own creative studio where he specialized in producing high profile visual projects for clients such as the New York Times, the Museum of Modern Art, Rockwell Group, and TED.com. Kwan never lost his passion for books and decided to return to his first love – writing – and the rest is history. So what’s next? Kwan is currently developing and planning to produce two TV shows, one Drama series with Amazon and the other called “The Emperor of Malibu” with CBS. Thank you to Kevin Kwan, Deb Spiess, and The John Cooper School for this special interview. To learn more about Kevin Kwan and Crazy Rich Asians, visit www.kevinkwanbooks.com. Visiting Authors and Kevin Kwan at Signature Author Series. Photography by Hello Woodlands. The Visiting Authors segment of the Signatures Author Series offers the unique opportunity to visit with a variety of authors who ae available before and after the luncheon to sign, sell and discuss their books. Before the event, Hello Woodlands interviewed Co-Chairs of the 2018 Signatures Author Series, Susan DeMarco and Christie Swanbeck, and visiting authors, Lorrie Parise and Kathryn Lane, about the upcoming event. Watch the video below and on our Facebook page. As is tradition, a portion of the proceeds from each Signatures event will be given to a local literacy organization. The 2018 beneficiary is the Montgomery County Memorial Library System (MCMLS) that seeks to be a leading resource for information, education, culture and recreation, contributing to life-long learning and adapted to the special needs and interests of the community. Learn more at countylibrary.org. The John Cooper School’s mission is to provide a challenging education in a caring environment to a diverse group of select students, enabling them to become critical and creative thinkers, effective communicators, responsible citizens and leaders, and lifetime learners. Learn more about The John Cooper School and upcoming events at www.johncooper.org/specialevents.